This salad is packed with all kinds of deliciousness. Seasoned ground beef, black beans, cheese, lettuce and don’t forget the Nacho cheese Doritos. They make the salad! Dovetailing tip: Brown 2 1/2 pounds of lean ground beef. Before adding the taco seasoning, remove about 2 cups of beef and allow to cool. Store in refrigerator to use for Meal 5, Cheesy BBQ Beef & Biscuit Casserole. 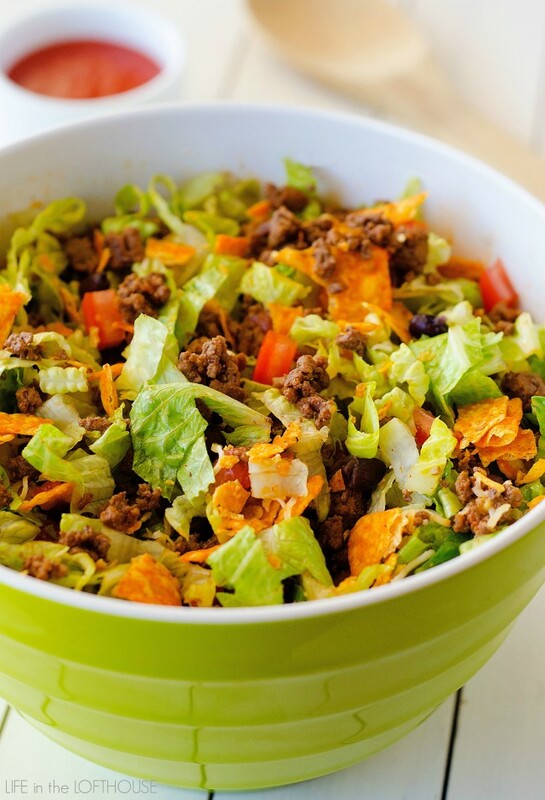 When ready to serve, add Doritos chips and dressing to salad. Toss to coat. Serve. ? Boost Flavor Appeal with Edible FLOWERS! To Make or Buy the Cake- That is the Question! Deal with the “Dog Days of Summer” with this Suggestion and Recipe! Good Stuff You’ll Be Glad to Know! Make Your Own Salts with a KICK! Lunch Hacks For Your School Year!